The House Intelligence Committee takes its job very seriously, which is why Ret. 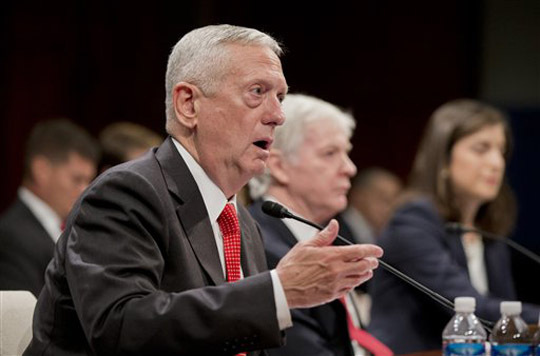 Marine Corps Gen. James Mattis was called in on Thursday to discuss the U.S. strategy for destroying the Islamic State group. With over four decades of military service under his belt, the general knows a thing or two about combat. Unfortunately, his assessment of how the commander in chief is handling the Middle East conundrum before him is not kind. Broadcasting up front an unwillingness to use ground troops in Iraq, despite an expanded mission there, creates problems, both Mattis and [former U.S. diplomat Ryan] Crocker said. While it is quite obvious that there are in fact “boots on the ground” in Iraq (i.e., Special Forces), it makes no sense whatsoever to show up at MacDill Air Force Base near Tampa, Fla., as Mr. Obama did, and assure troops that under no circumstances will they be deployed. It sends the wrong message to allies, it emboldens enemies, and it makes the job of those tasked with securing victory exponentially harder to complete. If the president was being honest with the American people, then he would sound much more like U.S. Army Chief of Staff Gen. Ray Odierno than a run-of-the-mill politician. Airstrikes have halted the advance of the Islamic State, also known by the acronyms ISIS or ISIL, General Odierno, now the Army chief of staff, told journalists from four news organizations, including The New York Times, in what aides said were his first public comments on the current situation in Iraq. Ultimately, though, “you’ve got to have ground forces that are capable of going in and rooting them out,” he said, referring to the Islamic extremists. The airstrikes “will not be the end all and be all solution in Iraq,” he said. Similarly, he added, the jihadis cannot be allowed to have a safe haven across the border in Syria. The general was careful not to say that ground troops had to be American, but the fact remains: ground troops will be necessary. If Joe Scarborough was on to something, and his theory that Mr. Obama is actively engaged in next-level “Art of War” strategic planning happened to be correct, Americans could breath a sigh of relief — but he’s not. The cable news host is wrong, and the public comments that multiple generals are making, while tactful, are their way of begging someone — anyone — to get Mr. Obama to listen to reason. If you are still unconvinced that the president is in over his head, then notice that the White House has not been cornered into answering the following question: Who will govern cities and towns all across Syria when Islamic State is defeated? It is almost as if reporters know that nobody knows the answers to the “Then what?” questions and they don’t want the American people to see just how lost and confused U.S. foreign policy is as the country begins to train and arm “moderate” Syrian rebels (“No, seriously, these are the good guys, we swear!”). As the situation in Iraq and Syria continues to unfold, look for whatever comments you can from men like Gen. Mattis and Gen. Odierno. Take note of what they’ve been saying, because those who refuse to take their sound advice on how to deal with Islamic State should be taken to task upon the unraveling. Next Entry Janet Yellen: We sprayed your house in gasoline. When is a good time to light the match? why take options off the table? midterm elections.